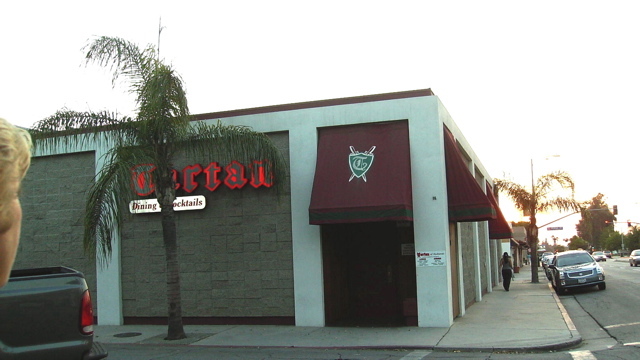 The other day Kathryn and I were driving on Redlands Boulevard near Orange Street, and I spotted the Tartan Restaurant on the left. Perhaps it was the distinctive red neon sign that reminded me of an English pub, or it could have been the white stucco underneath red canopies, but I mentioned it to Kathryn, telling her I�d never been there. She said she knew the former owners so she�d eaten there several times, liked it and wouldn�t mind eating there again. Well, that�s all it took. I whipped around the corner and we headed back to the Tartan. Since it was around five pm, I didn�t find a spot on the street, so I pulled into the lot across from the front door. Inside, the bar area was near the front, but we were shown to a booth. The restaurant was already crowded, and people were talking back and forth to each other like they do in a favorite neighborhood hangout, and it made the atmosphere casual and friendly. We were given menus, but they also had an eraser board with the day�s specials, listing such delicacies as crab and shrimp salad for $11.75, liver and onions, and the day�s soup, potato cheese. Homemade, I discovered. Since we were hungry, we bypassed the appetizers of shrimp cocktail at $7.25, or onion rings, $5.75, and went right for the food. Their lunch menu says their soup of the day is $3.50 for a cup during the week and $4.50 for a bowl. On Fridays they serve clam chowder for a little more, and chili is available every day at $4.00 for a cup and $5.50 a bowl. There were about six different salads, from a dinner salad for $3.75, to a grilled chicken breast or shrimp Caesar for $10.95. Some of the sandwiches include hot pastrami for $7.95, beef dip for $8.25, and they also offer tuna, tuna melt, grilled cheese, chicken breast on a bun for around eight dollars. Offered with your choice of wheat, rye, sourdough or white bread, sandwiches are served with fries or a cup of soup or salad. They even have a Boca veggie burger for $7.75. I�d heard about the Boca burger, and maybe one day I�ll try it. I�m not that eager, though. Give me a good beef or buffalo burger and I�m happy. Their special is the Tartan Burger, a 1/2 pound fresh Angus beef patty, which they order in twice weekly. It�s served with garnishes and fries for $6.75. While that sounded good, I wanted something from the dinner menu, and they have several selections of beef, ranging from an 8 oz top sirloin for $11.95, a 12 oz New York cut for $15.95, 16 oz porterhouse for $17.50, and two sizes of filet mignon, 8 and 12 oz, but no price listed. Instead, the menu says Market Price. Several fish and chicken selections are offered, charbroiled chicken breast, teriyaki chicken breast with pineapple for around eleven dollars, halibut steak for $14.25, salmon for $13.95, and on up to steak and lobster, again, Market Price. I didn�t ask how much, but maybe one day when I feel like splurging, I will. They also offer prime rib regular cut, for $16.50, and extra cut for $18.50, but they�re only offered on Saturdays. All dinners include soup or salad, and choice of baked potato, French fries, rice or vegetable. Au Gratin potatoes are available on Fridays. Kathryn chose the Caesar salad with shrimp and I selected the salmon. While I usually prefer salad, I decided to try their potato with cheese soup. I love good, homemade potato soup. My mother, bless her heart, really tried, but she never liked to cook. I remember often wishing I had a pet to pass my various dinners to so she�d think I ate it. To this day I don�t know what she put in her meatloaf, but one time it was especially terrible. I managed to get most of it down by drowning it in ketchup. But two dishes of hers that I really loved were her chicken and dumplings and her potato soup. Since she was a nurse and worked all the time, she made her dumplings the easy way by opening a can of biscuits and tearing off pieces, rolling them in little balls and dropping them in boiling broth filled with diced chicken, onion and celery. To me, they were delicious. When I later fixed them for my husband, he could barely eat them, saying I was one of those people who made doughy dumplings that would stick to the wall. He liked the light, fluffy ones, so I learned to make those for him. But every so often, I�d make a pot of doughy dumplings just like Mom�s. But I loved her potato soup. She didn�t do anything special, like add bacon, or cheese, or anything fancy. She just boiled the potatoes until they were almost mush, then added cream or sometimes even evaporated milk to the broth of onion and celery and carrots. I�d about given up on what I considered good potato soup as most restaurants add so many other things that I couldn�t even taste the potatoes, and they thicken the broth so much that it�s almost tasteless and looks like glue. But oh, the potato soup at the Tartan was wonderful. It had some cheese and a little thickening, but neither overpowered the potato taste. Next time I�ll know to order something light and have a big bowl of the soup. 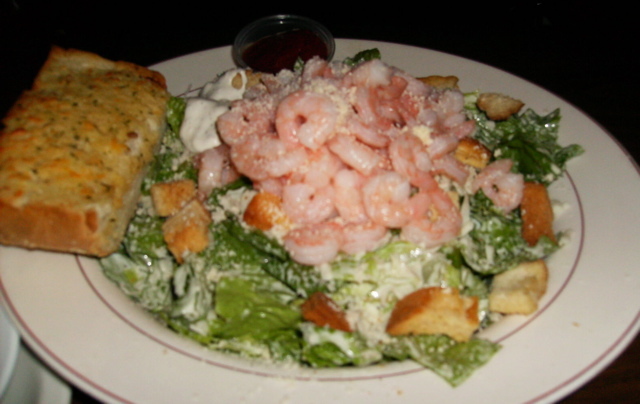 Kathryn�s salad arrived piled with shrimp, and although she ordered extra dressing, she didn�t need it, as they were generous. A thick slice of crispy garlic bread accompanied the salad. 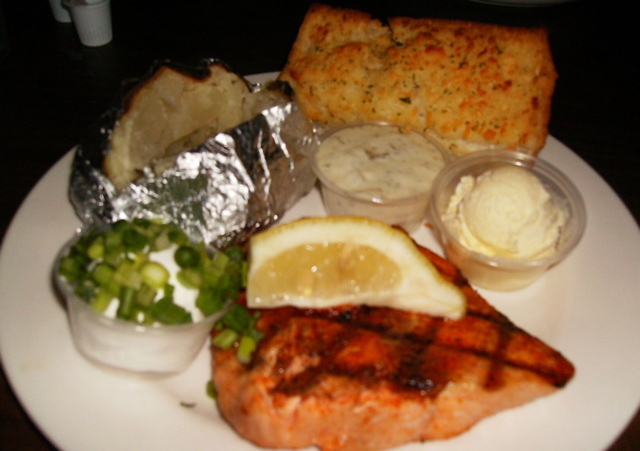 My salmon arrived with some garlic bread as well, but also included a hot baked potato with a side of sour cream covered with diced green onions. The tarter sauce tasted fresh, but I found I didn�t want to dilute the salmon, as it was among the best I�d tasted in a long time. Seared in light seasoning, it was tender and flakey. I�d certainly order it again. By then the restaurant was getting noisy, so we decided to skip dessert, although the server said their chocolate cake was worth trying. Kathryn and I were tempted to split a piece, but we managed to stay strong. Guess I�ll just have to make it up next time.